Wirgin Edixa 2MTL – John's Cameras. These are descriptions of my growing collection of old film cameras together with my experience of using them. Serial numbers to help with dating cameras. Wirgin were a German camera maker from the mid 20th century. Wirgin was formed in 1920 and ceased manufacture in 1971 (as far as I can tell). They made both viewfinder cameras and SLR cameras (and others). The SLR cameras were aimed at the cheaper end of the serious photography market. There was nothing wrong with them – see Edixa-Mat Reflex mod B – but they were clearly built to a price. The manual for this camera can be viewed and downloaded here. This particular Wirgin camera – Edixa 2MTL – is solid and well made but was not made buy Wirgin. It is, in fact, a rebadged Cosina Hi-Lite DLR. Cosina have consistently made top-quality cameras for other camera names – they were good enough for Nikon, Canon, Olympus and Zeiss Ikon (to name four) to sell rebadged Cosina cameras as their own. My Wallace Heaton Blue Book from 1971 has a Zodal 2MTL which is clearly the same camera (Zodal was the name used by Wallace Heaton for their own brand kit. This sold for £89.75 with a Cosinon 50 mm lens. The camera is metal and is heavy. It measures 145 by 95 by 50 mm and weighs 733 g with no lens. The top plate is pressed brass painted matt black – much of the paint has worn away revealing the underlying metal – clearly a much loved and well used camera: a big positive aspect for me. The base plate is aluminium, again painted matt black. The main body is cast aluminium. There is some plastic, but not very much. This camera offers TTL metering. This is a CdS meter powered by a button battery. Strangely, the instructions for the camera tell you how to fit the battery but offer no details as to which battery you should be using. The instructions for Cosina’s own version of this camera say that the battery should be a 675 type mercury button cell which are now universally banned. Fortunately, this meter works by centring the needle. When the needle is centred, there is no current flowing through the meter so it does not matter what voltage is producing the zero current. So, any button cell that will fit in the battery compartment will be fine (this really means 1.5v with modern cells). This type of circuit where an unknown resistance (the CdS cell) is balanced by three known resistances is known as a bridge circuit. The meter is activated by depressing a button on the left side of the lens mount (this also doubles as a depth of field preview button as it stops down the diaphragm). The meter needle is visible on the right side of the focus screen in the viewfinder. It is usual to use these as a shutter priority system – set the required shutter speed and then adjust the aperture until the meter needle is centred. So – time for a description. the top plate is uncluttered. On the right is the film advance lever. This is metal with a black plastic pad on the end for comfort. This lever moves through around 200° to advance the film one frame. this is not on a ratchet so it must be moved in one go. In front of the advance lever is a window to the frame counter. This counts up from one and is reset when the back is opened. Only the even-numbered frames are numbered with the odd-numbered frames represented by a dot. Left of the frame counter window is the shutter release button. This is bright chrome plated and is threaded for a standard cable release. Next to this is the shutter speed selector. This is pretty standard and runs from 1 second to 1/1000 seconds plus B. The shutter is a Copal Square shutter with metal blades and runs vertically. The speed selector will only turn between 1 and 1/1000. to go from 1 to 1/1000 (or 1/1000 to 1) you need to go almost a complete turn around the speeds. 1/125 is marked with a red X and is the synch speed for electronic flash. For flash bulbs, any shutter speed can be used. This shutter speed selector also doubles as the film speed selector. To select film speeds, you need to lift the selector before turning it. Available film speeds are from 25 ASA to 1600 ASA or DIN 15° to DIN 33°. On my camera, this scale is spotlessly clean apart from 25 ASA which suggests that the user was using Kodachrome 25 almost exclusively (I can think of no other 25 ASA film in the 1970s and 80s that would account for it). The pentaprism hump is of the size you would expect at this date – this is from just before Olympus rewrote the book with their OM series of cameras. On the left of the pentaprism hump is a pair of PC connectors for flash. One is marked X for electronic flash and must be used at 1/125 seconds or slower – this is marked on the shutter speed selector. The other PC connector is marked with a white M and is for flash bulbs – bulbs can be used at any shutter speed. On the front of the top plate is a pair of strap lugs. One of these is completely worn through so I can no longer attach a strap to the camera. As always, the front of the camera is dominated by the lens mount. 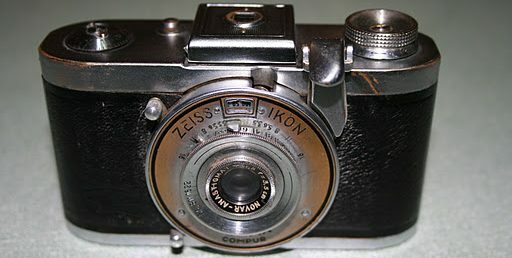 This is the M42 mount introduced by East German Zeiss Ikon in 1949. It is also known as the Praktica mount and Pentax mount as these two companies made the use of the M42 mount very common. I cannot comment on the lens as none was supplied. The manual (downloadable here) says that it was a Cosina brand Cosinon 50 mm lens. When focusing the lens (any M42 lens will fit) the only focus aid is a disc of micro-prisms in the centre which acts as a whole series off split-image centres – the first time I have seen this effect. It works very well. On the right of the lens mount is a self-timer lever. This is activated by turning the lever anticlockwise. When you press the shutter release, the mirror is raised immediately and the shutter fires after 11 seconds. I expect that this delay would have been 8 seconds when new as this is the usual delay. If you do not turn the setting lever as far as it can go, you get proportionally shorter delays. The baseplate of the camera has four times on it. Starting on the left is the lever to open the back. This is recessed and meeds to be turned through about 45° in the direction of the marked arrow. Next to this is the battery compartment which is designed to take one 675 type button cell. Just behind the lens is the tripod boss. This is, as you would expect, a 1/4 inch UNC thread.Towards the other end of the base plate is the button to allow the film to be rewound. This is well designed and does not need to be held in while rewinding which makes life much easier than with other cameras. Inside, this camera is entirely standard. Being Japanese, the camera needs foam light seals around the back and these are seriously perished. I doubt the designers expected the camera to still be used after nearly 50 years after manufacture so this is not really a criticism. The following is an advert for this camera from the 1971/2 Wallace Heaton catalogue. The model advertised is the Zodel 2MTL but it is the same camera – Cosina made these cameras for many resellers as well as Edixa and Zodal. Discussion group for Vintage Cameras which is open to all who have an interest in old and interesting cameras. collection-appareils which is in French with some parts also in English. One of my main resources. Butkus manuals who can supply PDF scans of many camera manuals. There is no charge, but a small donation is polite. camera patents this is a list of downloadable patents files dating back a very long way. Site belongs to Daniel Jiménez Chocrón. The Cottage by the Cranelake. Still We have hope. This blog is copyright by John Margetts. Please ask if you want to use any part – I shall probably say yes.